Aside from the troubles I wrote about in my previous post about spider mites on the cucumber and possible early blight on the cherry tomato everything else is going really well. I checked last year's numbers and I've already harvested double the amount from around the same time last year. 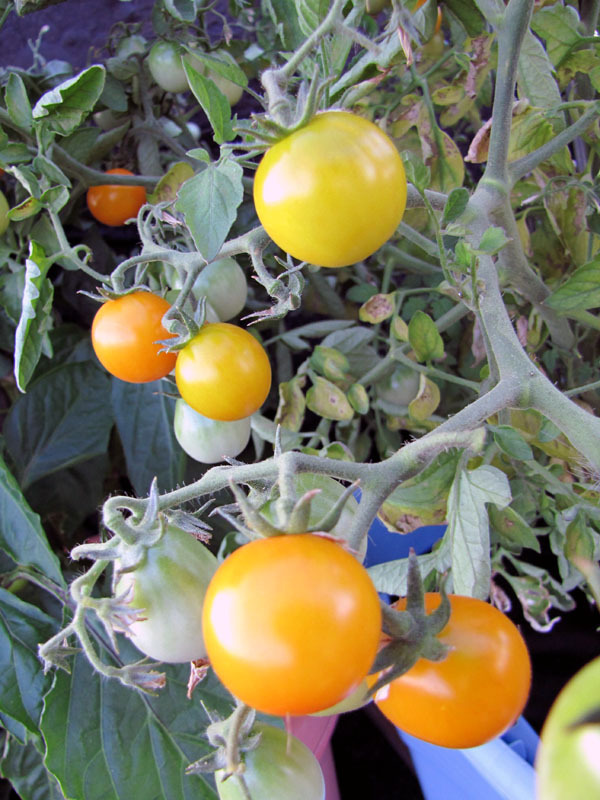 The Golden Nugget cherry tomato matured very quickly. On the package the approximate days to maturity says 60, but the plant on my roof was ready for picking in 45. If you have a short growing season (or you're just impatient) I highly recommend growing this plant. For some reason I didn't grow any cherry tomatos this year. Must do so next year! I think cherry tomatoes would be the first thing I would recommend to somebody just starting a vegetable garden. They mature earlier than many other fruiting vegetables, you can eat them right off the plant with zero food prep time and they produce throughout the season, not in one lump sum, so it encourages you to visit the garden every day. Thanks for all the info you put up, very interesting and great for reference. I'm in Prospect Heights with about 12 containers on a roof. This year I also added 3 EBs. I saw in a comment on mapleton-bklyn that you are using drip containers to keep your reservoirs full. Would you mind detailing that a little, or just taking a picture of it? The tomatoes in by EBs have gotten so big I need to water them twice a day, and sometimes I'm not able to. My one box completely dried out for awhile without me knowing (I think the plants were able to still get water with roots in the reservoir) and now I have terrible BER.